Numerous businesses have already announced plans to remain closed Tuesday and Wednesday as the massive Hurricane María approaches Puerto Rico, bringing with it potentially catastrophic damages, as weather officials have said. Burger King: The restaurant chain will begin closing locations on Tuesday, as weather conditions dictate. All of the restaurants, as well as the company’s headquarters, will remain closed Wednesday. Association of Co-operative Executives: Credit unions will close Tuesday at noon, and will reopen either Thursday or Friday, depending on the circumstances. Banco Popular: The bank’s will offer services until noon tomorrow at 102 branches (see here for list of banks that will be open.) Branches will remain closed Wednesday and Thursday. Banco Santander: Will remain open Tuesday until 1 p.m. and closed Wednesday and Thursday. Telephone-based services will operate 24/7. The bank will waive late fees on personal loans, credit cards and commercial loans until Sept. 25. It will also waive the fee charged to conduct transactions over the phone. FirstBank: Will close all of its branches, including FirstMortgage and Money Express, Tuesday and Wednesday. Customers may access information about their bank accounts and conduct transactions via internet and mobile banking, as well as through the bank’s 200 ATH machines throughout the island. Scotiabank: Will operate from 8 a.m. to 11 p.m. at branches, and until noon at its headquarters. All operations will remain closed Wednesday and Thursday. It’s customer service center will continue operating, as well as Scotia Móvil and Scotia online. Oriental: The bank’s 48 branches, service centers and central offices will close Tuesday at noon, except for the Mayagüez branch, which will remain closed. All of the branches, service centers and headquarters will remain closed Wednesday and Thursday. Customers are encouraged to conduct transactions online and through the bank’s mobile app. Society for Human Resources Management: Announced it has postponed its annual conference slated from Sept. 20-22 at the Sheraton Hotel and Casino in San Juan. The trade group will announce the new date soonest. Casino Metro: The casino is closing down at midnight tonight, until further notice. The casino will use its social networks to notify when it will reopen. T-Mobile: Operations will remain closed Tuesday and Wednesday. Corporate offices will reopen either Thursday or Friday, depending on weather conditions and the availability of electricity. Editor’s Note: This list will be constantly updated as new cancellations come in. Please send yours to news@newsismybusiness.com. 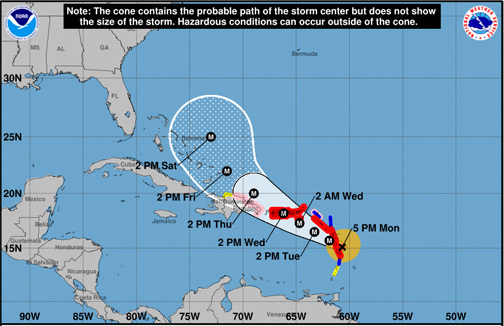 Hey Buddy!, I found this information for you: "Cancellations abound in PR due to Hurricane María". Here is the website link: https://newsismybusiness.com/cancellations-across-businesses/. Thank you.